Martin Baty Lewis (1806–1884), soldier and county official, was born in Clark County, Indiana, on January 13, 1806, the eldest son of Sally (Lemasters) and Samuel S. Lewis, who also served at the Siege of Bexar. He married Nancy Moore 1825 in Indiana and they had eleven children. He emigrated to Texas in January 1830, with his family following in March 1832. He settled first on Ayish Bayou in what is now San Augustine County. They then moved to Indian Creek near Bevil’s Settlement in what is now Jasper County. His league of land is located on the east bank of the Angelina River, adjoining William Jourdan on the north and his father, Col. Samuel S. Lewis on the west. In August 1832 Lewis was a sergeant major in the battalion commanded by James Whitis Bullock, and he participated in the battle of Nacogdoches. In November and December 1835 he was captain of a company of East Texas volunteers that took part in the Siege of Bexar. In July 1836, when a Mexican incursion into Texas by Gen. José Urrea was feared, Lewis raised a company of Jasper volunteers and marched to join the Army of the Republic of Texas on the Coleto. He resigned this command in August 1836. Lewis served as county surveyor of Jasper County from its organization in 1836 until 1845. In 1844 he was also chief justice of Jasper County. In 1845 he patented title to 2,958 acres of land in Jasper County. Lewis Ferry on the Neches River is believed to have been named for him. He also presided over the organization of Newton County when it and Jasper were divided. He ordered Newton County’s first elections. In 1847 he was a sergeant in the Texas Cavalry under Capt Veatch & Lt. Col. Bell in the Mexican-American War. 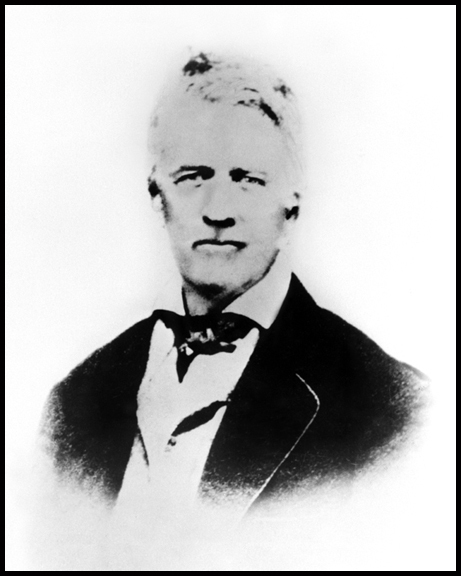 He left Texas for California for the gold rush of 1849, and in 1863 he settled at Millertown, Fresno County, California where he served as surveyor and a judge. In 1851 he served as an Adjutant with the Mariposa Battalion under the command of Maj. James Savage, and took part in the discovery of Yosemite National Park. He died March 1884 in Madera County, California. Pleasant Marshall Bull was born Feb. 18, 1808 in Grainger County Tennessee to John Valentine Bull and Fetna Bean. He came to Texas to acquire land, arriving in 1831 and settling in Brazoria, Austin Colony. 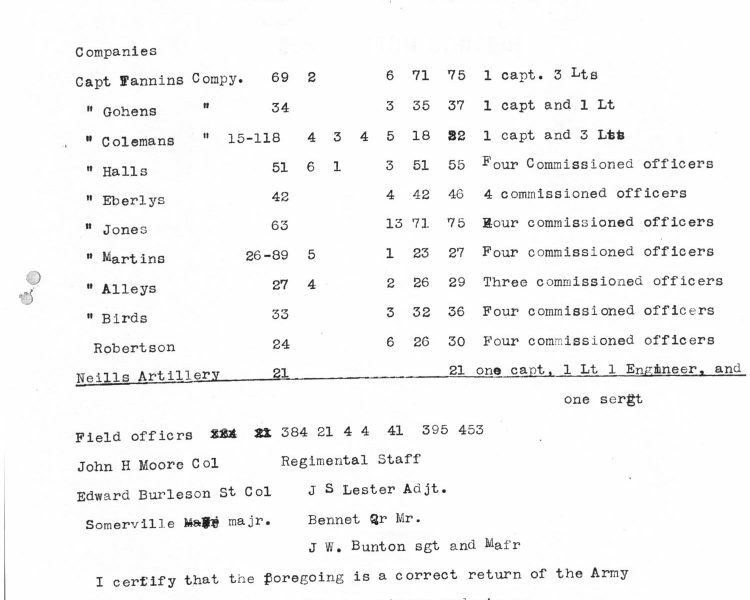 He was a veteran of the Battle of Concepcion and the Battle of Bexar and is on the muster roll of the Siege of Bexar in Capt. John York’s company. He was en route to San Jacinto when he fell ill. He was taken by wagon to his fiance, Marion Alsbury, the daughter of Thomas Alsbury, one of Austin’s Old Three Hundred settlers. They boarded a ship at Galveston bound for New Orleans, perhaps to seek medical help, but he died April 24, 1836, shortly after the Battle of San Jacinto and was buried at sea in Galveston Bay. He never married and had no children. Pleasant’s family moved to Texas in 1853 to claim his bounty. Colonel Moore was elected Colonel Commandant of the Army of Texas on October 11, 1835 in Gonzales, the same day Stephen F. Austin was elected Commander in Chief and Edward Burleson, Lieutenant Colonel. Moore resigned his office on November 6th in Bexar and Ed Burleson was elected to replace him on November 7th. John Henry Moore, one of the Old Three Hundred and a participant in the Texas Revolution, was born in Rome, Tennessee, on August 13, 1800. According to tradition he ran away from college in Tennessee to avoid studying Latin and went to Texas in 1818. His father took him back to Tennessee, after which Moore returned to Texas in 1821 as one of the first settlers on the upper Colorado River. He fought the Indians along the Colorado in 1823 and 1824 and went into partnership with Thomas Gray as one of Stephen F. Austin’s original settlers. Moore and Gray received title to a league and a labor of land now in Brazoria and Colorado counties on August 16, 1824. The census of March 1826 listed Moore as a farmer and stock raiser, aged between twenty-five and forty. He was then a single man with two servants. He married Eliza Cummins, daughter of James Cummins, probably before 1828, when he built a twin blockhouse called Moore’s Fort at the site where La Grange was established on May 17, 1831. Moore lived at La Grange until 1838, when he built a home on his plantation nine miles north of the town. In 1834 he led an expedition against the Waco and Tawakoni Indians on the upper Brazos River, and in July 1835 he organized four companies of volunteers to attack the Tawakonis in Limestone County. In September 1835 he warned of the expected Mexican attack and was so outspoken in favor of Texas independence that he was ordered arrested by Martín Perfecto de Cos. On September 25, 1835, the Committee of Safety at Gonzales asked Moore for reinforcements, and he marched to Gonzales to take command of the Texans in the battle of Gonzales on October 2. He is said to have designed the “Come and Take It” banner (see GONZALES “COME AND TAKE IT” CANNON). He was elected colonel of the volunteer army, and after serving as a member of the council of war called to discuss the best means of protection against the enemy, he was ordered by Austin to organize a cavalry company of the men who had pistols and double-barreled shotguns. In January 1839 Moore commanded three companies of volunteers in a campaign against the Comanches. When he returned from that campaign he was personally directed by President Sam Houston to raise 200 men to protect San Antonio from both Indian and Mexican attacks. Again in October 1840 he fought the Comanches between the Concho and Colorado rivers and carved his name on the ruins of the old San Sabá Presidio. In March 1842 Moore commanded two companies of volunteers raised in the Fayette County area to assist in driving Mexican raiders under the command of Rafael Vásquez from San Antonio. In July 1842 he was authorized to raise 200 volunteers for the defense of the western frontier. While pursuing Indians who attacked on Cummins Creek in August 1842 Moore became so ill with inflammatory rheumatism that the Telegraph and Texas Register announced his death on August 17, 1842. The report, however, was premature. During the raid of Gen. Adrián Woll on San Antonio during September 1842, Moore again raised a company of volunteers and, serving under the command of Mathew Caldwell, participated in the pursuit of Woll to the Rio Grande. 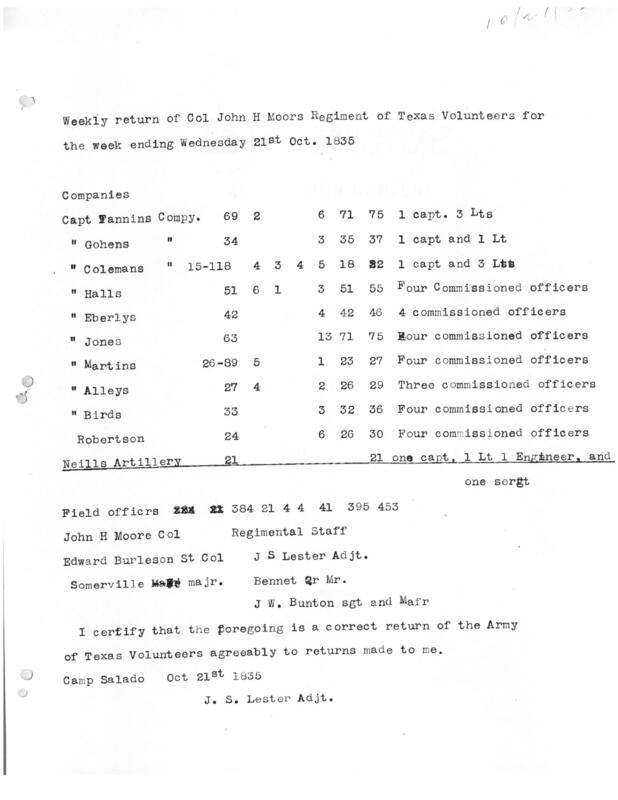 In September 1861 Moore enrolled in Company F, Terry’s Texas Rangers (the Eighth Texas Cavalryqv). Too old to fight, he was appointed to a committee to secure bonds to finance the war. During the Civil War he lost most of his property, much of which was slaves, but he recovered financially before his death. He died on December 2, 1880, though the marker erected at his grave by the Texas Centennial Commission in 1936 gives the date of his death as February 25, 1877. Moore was buried in the family cemetery eight miles north of La Grange. Colonel Moore’s plantation home and cemetery are located seven miles North of present day La Grange on what used to be our family’s property. A large Spanish hacienda style home that originally served as a hunting lodge was built on the site of Colonel Moore’s own home there on the highest point in Fayette County. My wife and I were married in that house in 1984. Sadly, the place burnt down in early September 2011 in a fire that erupted simultaneously with the big Bastrop fire in 2011. On the wall of the ranch house was what I suspect was the original framed photo of Colonel Moore – the only photo of him I’ve seen used in publication. Our family spent considerable time maintaining his old cemetery and took great pride in doing it. My mom was responsible (though she is not credited) for locating and raising awareness for Moore’s Fort – Colonel Moore’s twin blockhouse that is now reassembled in Round Top. A few years ago, she donated a downtown lot to the city of La Grange stating that it should be designated as a park acknowledging the history of Fayette County. She asked that it be named in Colonel Moore’s honor and have a statue of him there, but local politics prevailed. The original deed to that property had Colonel Moore’s signature on it. Though I am not related to Colonel Moore, I feel very close him. I am constantly in search for new information on his exploits. I have an extensive library of books that reference him for mostly his Indian expeditions or the Battle of Gonzales. My goal is to bring his other accomplishments to light.